Employment in Alabama’s 5th Congressional District has been hit hard by China. According to one estimate for 2001 to 2011, 3.77% of all jobs in the district were displaced because of manufacturing layoffs. Also, the moderate Republican congressman representing the 5th District lost his job. In a recent paper, four economists connect the decline in manufacturing to local election results. Analyzing massive amounts of voting data, these four researchers concluded that political extremists benefit when factories close. It all depends, though, on whether the district was originally Republican or Democrat. In districts that had been dominated by the Republican Party, moderate Republican incumbents were replaced by extreme right wing Republicans. In those with Democratic representatives, factory closings correlated to one of two possibilities. If the district was characterized by an African American population, then a candidate with a more extreme left wing position won. Otherwise, a moderate Democratic incumbent typically lost to a Republican. So, with Democratic centrists moving leftward and the right moving further rightward, we have the middle disappearing. 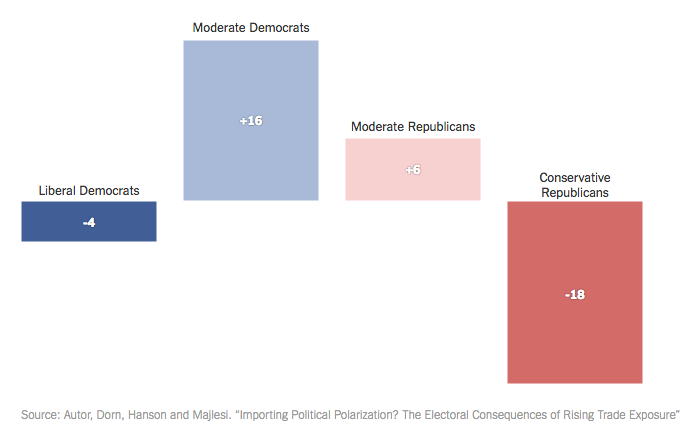 Between 2002 and 2010, the proportion of moderates in the House decreased from 56.8% to 37.1%. Visible locally, a factory closing that the community blames on China has a devastating impact on workers. As they relocate to less lucrative jobs, workers experience a decline in wages. Correspondingly, municipalities feel greater demand for disability, retirement and medical payments while unemployment insurance and income assistance also rise. Meanwhile, our savings from cheaper imported goods can be invisible. So very charmingly, below, Nobel laureate Milton Friedman explains that tariffs can appear attractive because the job numbers they boost are visible while the costs to consumers and other industries are invisible. However, that concentrated benefit is far less than the diffuse cost. Do watch the full six minutes. Dr. Friedman presents a wonderful banana example at the end. My sources and more: Thanks to the NY Times for alerting me to the new Autor, Dorn, Hanson and Majlesi paper on political polarization that was the perfect follow-up to the Autor, Dorn, Hanson 2013 paper. As background, I also recommend this fivethirtyeight trade discussion and David Autor’s econtalk podcast. Please note that the sentences that refer to Milton Friedman were published in a previous econlife and my Alabama statistic came from the (left of center) Economic Policy Institute.